Since 2012 August 3rd its gives the news of Muslim culture, traditions & art of living to the Muslim society for every moments. Ceylon Muslim is a digital content platform reporting and writing on issues in SriLanka, with a specific focus on the 25 districts. in 2012. Our content includes news, ground reportage, news analysis, research, opinion and blogs. We report and write on a wide range of issues and events. Our core strengths include our deep access in the muslim areas, incisive editorial acumen and insightful news analysis and opinions. 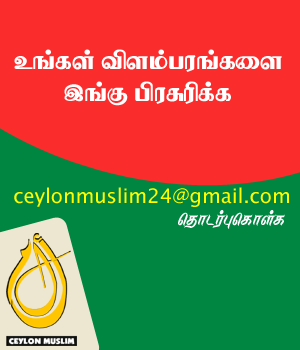 Headquartered in Colombo, Ceylon Muslim has ground reporters in all the districts. If you have any problems or have comments or suggestions for improving our web, please contact ceylonmuslim.com@gmail.com or www.facebook.com/ceylonmuslim to like us on Facebook and we will do our best to assist you. Your feedback is important to us.